"'BURN' is an accurate title for Deep Purple's new album, because that's exactly what they do! This album has the excitement found in "In Rock" and "Made In Japan" and sorely lacking in "Who Do We Think We Are". "In Rock" set the roots for Purple's style which gained them recognition as the King Midas's of rock. After all they are now one of the world's top selling and top touring bands but their future was questionable after the split of vocalist lan Gillan and bass player Roger Glover. This album shows that the new replacements Glenn Hughes, on bass and vocals and vocalist Dave Coverdale have acted as a catalyst, injecting a new energy into the remaining members' music. "Burn" kicks off with the title track; the most high powered number on the album. Ritchie Blackmore knocks out a series of meaty chords and the rest of the band join in and sound damn tight, it just doesn't sound as if they've only been together for a matter of months. There is some nice soloing from Jon and Ritchie; playing classical type passages which sounds vaguely reminiscent of their "In Rock" era. "Might Just Take Your Life" drags to the point of lethargy although it's brightened up by Lord's keyboard virtuosity. "Lay Down, Stay Down" indicates the direction Purple are heading in and highlights Glenn's influence; The song's funky and this makes the band come over funky too. Ritchie plays a beautiful solo, tight, precise but still containing the right amount of energy needed to make it rock. "Sail Away" has a nice soul beat that you hear when Stevie Wonder is knocking out notes on his clavinet. There is some nice vocal interplay between Dave and Glenn and some weird sounds followed by a mellow, even laid back solo from Ritchie, who can be gentle as he is aggressive (listen to "When A Blind Man Cries"). Side Two opens up with "You Fool No One" which is lan Paice's track. Everything is centred around his tireless rhythmic passages and features an interesting phased solo from Mr. Blackmore. "What's Going On Here" is the hardest rocker on the album, Jon having really opened up and the piano solo is just as effective as anything he's done with electronics. It seems that Purple's enthusiasm has returned again and this album is like a rebirth for them. All the tickets are sold out on their forthcoming American tour and their crown is getting heavier and harder to shift and to tell you the truth I can't forsee that happening yet." "DEEP Purple, as a band, have suffered from a mass musical malaise for some time now. Their last album "Stormbringer" typified this to a startling exent. As Jon Lord agrees, the band had become tired and bored and it showed. "Stormbringer" was certainly not what Deep.Purple were about. Instead of a heads up onslaught on the senses, relieved on occasion with more melodically influenced breaks, the album was so laidback it was almost horizontal. Now, of course, Ritchle Blackmore has left the band and his replacement Tommy Bolin shows what a difference can be wrought in an apparently dormant band by the addition of just one new member. In total, " Come Taste The Band" comes across as an album made by a fresh, alive and creative unit - light years from the tedium of "Stormbringer." It Is not easy to overstate the influence of Bolin. For a start, he wrote eight of the tracks on this ten track opus and he's obviously had a great deal of freedom given him by the other five. In shaping the band's musical direction. Furthermore, he is an inventive and tasteful guitarist - Blackmore is able enough, to be sure, but in the context of Purple he had become just a trifle stereotyped. Bolin, on the other hand, is shiny, new and untainted by Purple's longstanding musical and personal problems. The album starts in fine roaring style with "Comin' Home," a metal-sharp belter which gives Coverdale plenty of room for his vocal pyrotechnics. "Lady Luck," "Gettin' Tighter" and "Dealer" continue the theme of power, with just o bit of malevolance showing through on the latter through Hughes's moody bass lines. "Owed To G," despite it's irritating and ersatz underground title, and "Love Child" give Lord a chance to shine. And It must be stated here that the man is a pretty fine keyboardist. He tends at times to overstate the classicism in his style but, one feels, his solo excursions are going a long way to expunge the more obvious and hence annoying traits in this formalised approach. A good album, representative of Purple and a promising indicator of things to come. They may never achieve again the public and critical acceptance which was theirs with past efforts but they show here that they're still a viable band, capable of producing exciting and Interesting music." "Deep Purple are not the band they once were - and I for one. don't mind thal at all. The older Purple sound now sounds terribly dated, but the new sounds prelty contemporary - on this single I was even reminded somewhat of Steely Dan. The "Burn" LP from which this comes is high, high, high in the lists and that could hurt sales of the single. Opening with a spot of drumming over belching organ, the side avoids the crunching excesses or previous Deep Purple records. The vocals are just fine too: expressive, clear and coherent. In America "Might Just Take Your Life" is 97 in the chart I have - but it is climbing. I doubt whether it'll burst into our very own and truly wonderful Top Twenty though." "WHEN YOU weigh it up, Deep Purple are in the most unenviable of positions - they have a certain reputation to live up to, right? Presumably in an attempt to retain the magical quality which obviously makes them more than Another Rock and Roll Band they've maintained certain style characteristics that unfortunately never allowed them to develop musically. And even though they got themselves a new singer and bass player, their last album "Burn" was pretty much a predictable member of the Purple cycle, and certainly nothing innovatory. To an extent "Stonnbringer" follows a similar tactical plan. The title track is a roaring riff of cliches, which later reappear with variations on the barren "Love Don't Mean A Thing," and the electronic groan called "Lady Double Dealer." The rest of the album is, well, a damn sight better, with sparks of ingenuity occasionally lighting up like a hundred Ronson electronics clicked in unison. But the overall impression of the album is one of change: Deep Purple are slipping out of that worn and shiny cloak which was so easily recognisable. The most distinctive facet of their new image comes with such numbers as "Hold On," "You Can't Do It Right," "High Ball Shooter" and to a lesser degree "Gypsy." All these exude a laid-back funkiness, no doubt an influence of Black Soul music. Perhaps the key phrase to this set actually is laid-back. Glenn Hughes on bass and drummer lan Paice rock steady throughout, laying down a meaty (though strangely non-eventful), rhythmic tempo. "Holy Man" is decidedly dull, and Paice and Hughes only become inventive on the last track of side one, "Hold On." In the same way the vocal chores of Hughes and David Coverdale complement the musical feel, except for some over-dramatisation by Coverdale which mars the finest composition of the set, "Soldier Of Fortune." It is probably Ritchie Blackmore who commands the majority of honours for this album. He is superb, placing neat, cohesive figures into "Hold On," chopping fine rhythm patterns on "You Can't Do It Right" and easing through some deliberately mellow and refined lines on "Love Don't Mean A Thing." And Jon Lord is so laid back he doesn't make any significant keyboard contributions until the third cut on side two. More so than most of their previous albums '"Stormbringer" is quite a satisfying musical excursion, despite the criticisms I've already noted, and plus the fact that the lyrics are generally very ordinary. One should not, however, overlook the fact this is quite an adventurous album for Purple insomuch as it attempts to stay clear of tried and tested formulas. And the result, even if flawed, does at least partly enhance their musical credibility. "More slow and soulful rather than the high-speed heavy-metal blitzkrieg you might expect. A dark, thick, angry churning, sound from the 'Come Taste The Band' album and rather impressive." 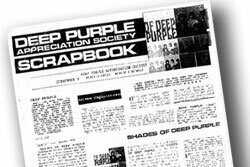 sixteen pages containing over 100 contemporary newspaper and magazine reviews covering Deep Purple releases from 1968-1982. It is available exclusively from the dpas online store.